This luxurious elixir combines Natural Vitamin E with Certified Organic Moroccan Argan Oil to expertly hydrate, rejuvenate and condition hair, leaving locks supple and fresh. 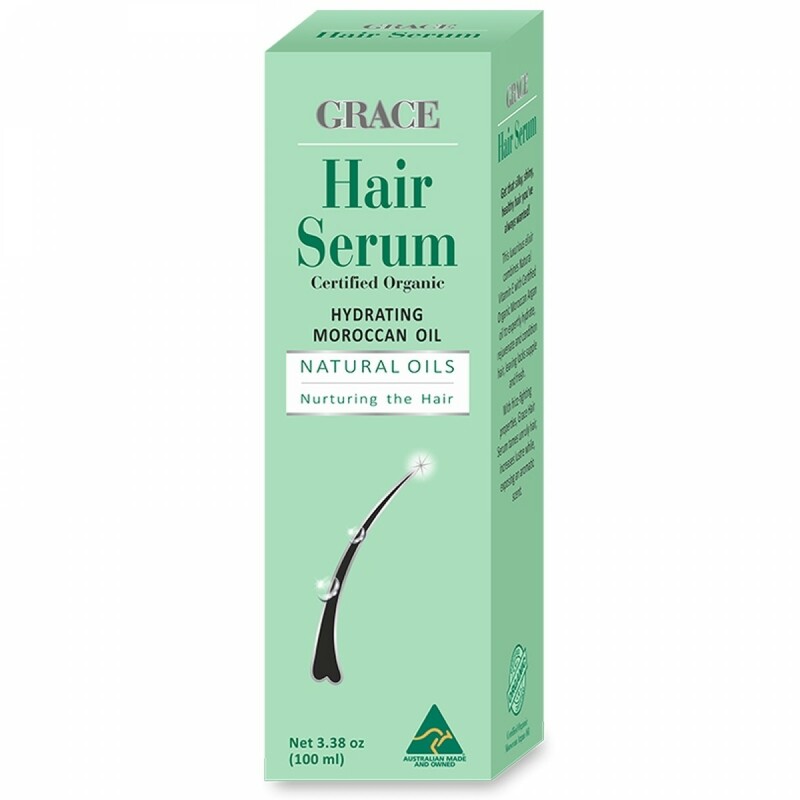 With frizz-fighting properties, Grace Hair Serum tames unruly hair, increases lustre, while exposing an aromatic scent. Argan Oil has a reputation as natures wonder elixir for the hair, skin and body, due to the highly potent botanical nutrients. Moroccan Argan Oil is rich in vitamns, minerals and antioxidants - this age-old beauty secret has many uses, helping to hydrate and soften your hair, face, body and nails. The high content of antioxidants, essential fatty acids and vitamin E, help to revitalize, increase hair elasticity and consistently restore shine to dull, lifeless hair. Moroccan Argan Oil is a powerful antioxidant, UV-protectant and free-radical neutralizer. Grace Hair Serum only sources the highest quality Argan Oil originating from argan trees grown in Morocco. The Argan Oil used in all our hair products is manufactured by a cold-press process. Cyclotetrasiloxane, Argania Spinosa Kernel Oil (Certified Organic Moroccan Argan Oil), Cyclopentasiloxane, Tocopherol (Natural Vitamin E), Fragrance.